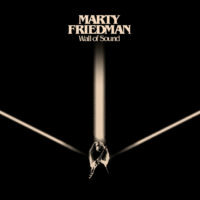 As we’ve reported, former Cacophony and Megadeth guitarist Marty Friedman will release his new album, Wall of Sound, August 4 via Prosthetic Records. The album was produced by Friedman, engineered by Paul Fig (Ghost, Rush, Alice in Chains) and mixed by Jens Bogren (Lamb of God, Opeth). As always, it features an incredibly talented group of musicians. The core band on Wall of Sound includes Anup Sastry, who shares drumming duties with veteran Gregg Bissonette, and Japanese musician Kiyoshi, one of the most aggressive bass goddesses on the planet. Guests include Jinxx of Black Veil Brides and Shiv Mehra of Deafheaven; Jorgen Munkeby of Shining lends his voice to the album’s only non-instrumental track. Today we present the exclusive premiere of “Whiteworm,” one of Wall of Sound’s pivotal tracks. We asked Friedman to break down the new tune, and he offered oodles of insight. “I tend to sound like myself even when I’m not trying to, so it is a little thrill to come up with something that doesn’t smell like me at all. Also, I think a subliminal goal in rock music is to have an intro that many people will want to pick up a guitar and play—’Stairway to Heaven,’ ‘Smoke on the Water,’ etc. Since those days, more challenging things can inspire people too. This intro would have made me run to a guitar to try to learn it when I was 15. “Also I like to have progressive elements in my music, but I don’t like to bring attention to them. In ‘Whiteworm’ there are many spots that feel like odd time, but are actually not, and other parts that are in an odd time signature, but don’t feel like they are. Over all, you don’t notice either of these things unless you listen closely for them, or try to play them, as the song is structured to build tension and then make you feel good when certain melodies hit. “There are unorthodox chord changes here, but no ‘expensive chords.’ For example, the chorus starts in D major and ends in D minor, but the melody is such that it makes its own kind of sense. I prefer to work with chords that way rather than start with strange chords. My ears tune out when I hear chords that are too jazzy; however, I imply the hell out of unusually voiced chords with my solos on this song and on most of my songs. “It’s a habit of mine to take a 1-5 power chord and imply alien and illegal intervals over it. The ultra-fast playing that is doubled an octave above is very typical of my stuff, so when I do that kind of thing, I make damn sure that it happens in a part where it is climactic and has particular impact. A well-timed blazing run is awesome, and the more you make music, the more you know when it is most delicious to use this weapon—and more importantly, when not to. Friedman also discussed some of the gear he used when recording Wall of Sound, including his new Jackson MF-1 signature guitar. “Jackson is the king of metal guitar, but I wanted that plus some more versatility,” he says. “The intro to ‘Whiteworm’ was played on the MF-1, and that is a hard tone to really nail from a guitar that is known for screaming solos and heavy riffs. So getting both was a huge challenge, but I insisted on it. I don’t like to look backward in my career, so I would need a damn good reason to go back to Jackson. The quality of the people at the company and the commitment to making my guitar exactly what I wanted it to be got me on board. Pre-orders for Wall of Sound are available here. For more about Friedman, visit martyfriedman.com—and be sure to check out his upcoming tour dates below.